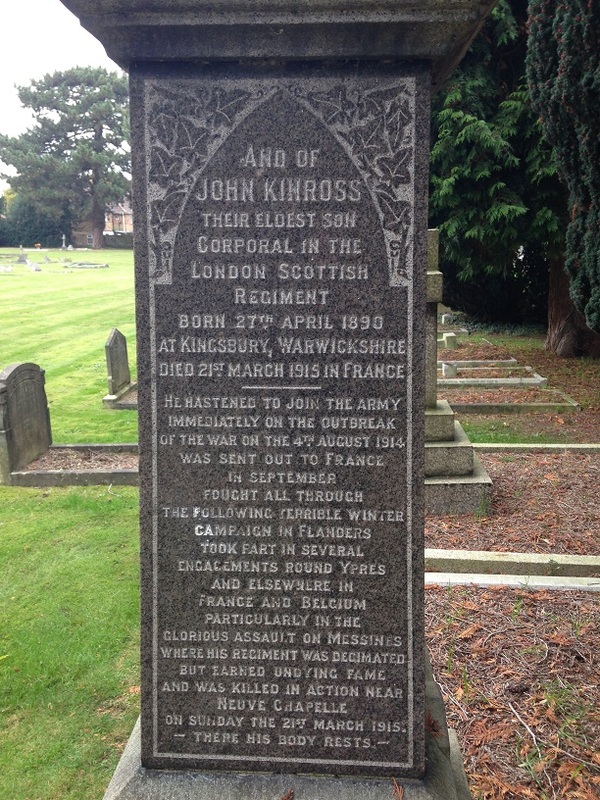 It is hard to tell the story of John Kinross without first focusing on his father, also John Kinross, known locally as ‘Jock’. He was a forceful presence not only in his son’s life, but also in the life of the village. Moving south, Jock took on a farm in Warwickshire. 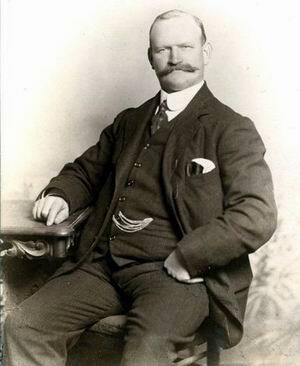 It was in that county that Jock and Isabella’s third child, John, was born, in Kingsbury on 27 April 1890. 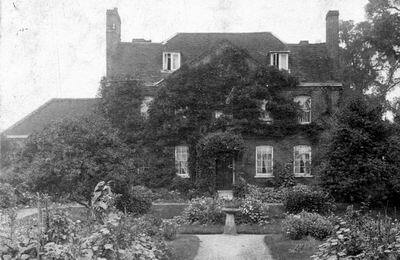 Jock was clearly ambitious; with his brother James, he then took on four farms in Middlesex. 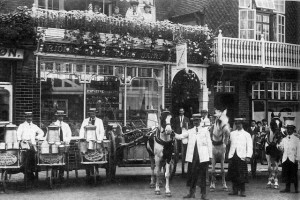 In 1894 Jock and Isabella moved with their five young children to Buckinghamshire, to Riding Court Farm and Ditton Park in Datchet. John was four years old when his family moved to the village and his two youngest sisters were also born here. By the time of the 1901 census, Jock and Isabella had seven children: Jenny (Janet), Lizzie, John, Isabella, James, Peggy (Margaret) and Dora (Dorothy). There is an excellent website, Kinross Genealogy, which gives very detailed, well-researched information about the Kinross family and includes the following photographs. Jock had firm views on how to succeed in farming. “Kinross is strongly of the opinion that a farmer must be a man of enterprise and energy if he is to make a successful business of it and that if he will combine with these points mental ability and scientific knowledge there is no doubt that farming as a business can be made profitable in the present day,” reported Slough Observer. Jock was a central figure in local life, behaving as, and being treated as, the ‘Squire’ of the village. He became a County Councillor and Justice of the Peace. 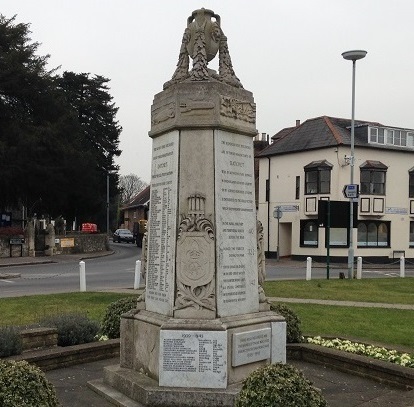 He was one of the original members of Datchet Parish Council, becoming chairman of the council for eight years. He was also a chairman of the Cemetery Committee, a trustee of the Barker Bridge House Trust, a school manager, and chairman of the Horticultural Society. It was said that he would donate generously to any cause raising funds for the welfare of the village, and he was largely responsible for securing a new fire engine for the village. Jock seems to have thrown himself into affairs of the heart with much the same enthusiasm as he showed for affairs of the village and farming. His wife, Isabella, was with her in-laws in Logie, Stirling, on the 1911 Census (which recorded her as 45 years old, married 21 years, and mother of seven children, all still living), although how long she stayed there isn’t yet known. 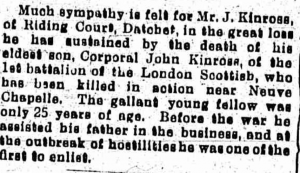 Meanwhile, the Kinross Genealogy website reveals that Jock had an affair with Lilian Winifred Sinnock, with whom he had two daughters, in 1912 and 1914, both given the surname Miller. 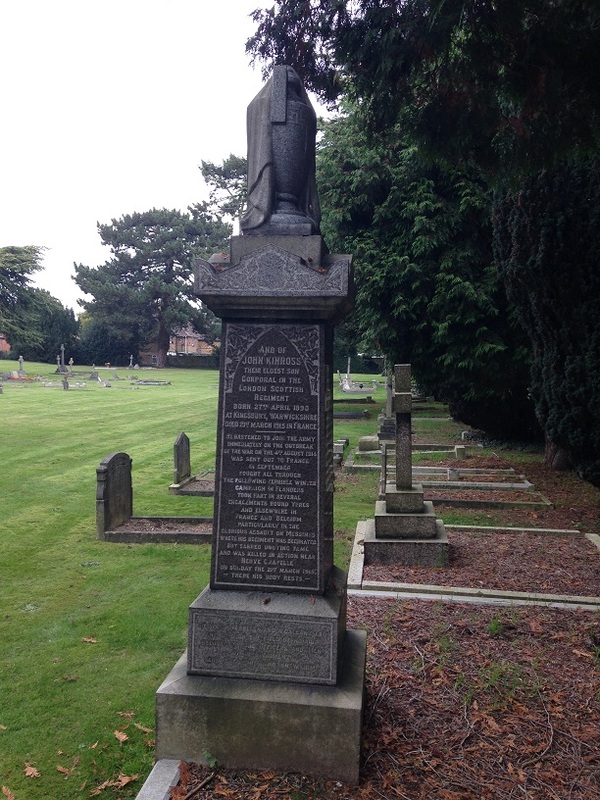 Isabella died on 10 May 1913 in Datchet and buried at the family grave in Datchet Cemetery. Almost exactly a year after her death, and around the same time that his lover Lilian was giving birth to their second child, Jock married a woman 30 years his junior. May Violet Henriette Purser was just 22 when they married at Paddington, London. May was a farmer’s daughter; her father ran Tanhouse Farm at Colnbrook. Born c1892, she was younger than most of Jock’s children, including John. Jock even fibbed about his own age, knocking three years off his true age of 52 on the marriage certificate. To complicate the family arrangements even further, two of Jock’s daughters married two of May’s older brothers. Jock and May went on to have four children of their own from 1915-1927. 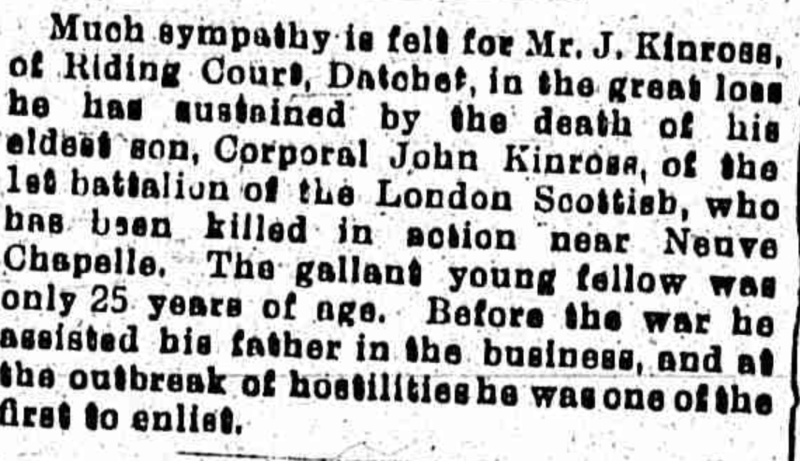 When war broke out, Jock’s eldest son, John, enlisted in London in August 1914. He became Corporal 2163, in the 14th Battalion of the London Regiment (London Scottish). The Battalion was formed in August 1914 at 59 Buckingham Gate. It was part of 4th London Brigade, 2nd London Division. On mobilisation they moved to Abbotts Langley. On 16 September 1914 they left the Division and landed at Le Havre. They were engaged at Messines on 31 October 1914 under the command of the Cavalry Corps. In November 1914 they came under the command of 1st Brigade in 1st Division. At the time the Division was engaged at the First Battle of Ypres. 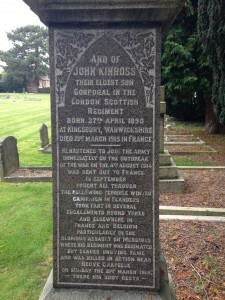 The Kinross Geneaology website has published two letters written by John’s Commanding Officer, Lieutenant H A H Newington, and his best friend, 2nd Lieutenant F A J Macfarlane, to Jock Kinross. 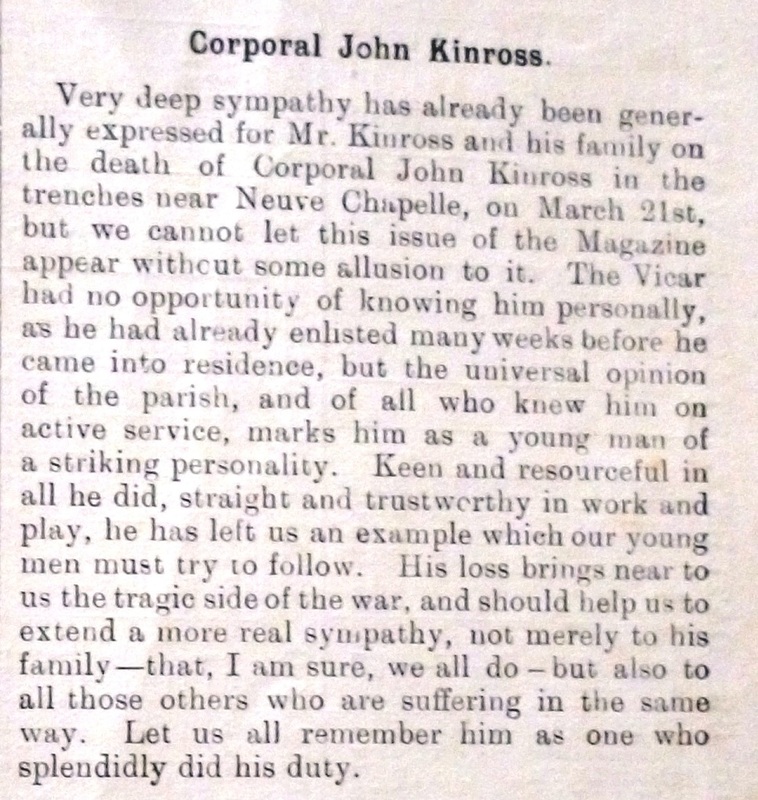 These letters were originally published in a printed memorial document for John Kinross, 1915. 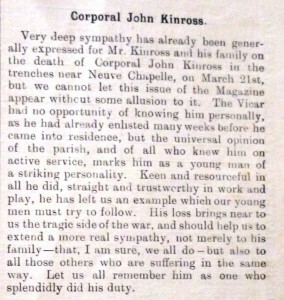 John’s Commanding Officer wrote explaining that John had been shot while he was in the trenches. He was improving some head cover when a bullet came through the parapet and struck him on the head. He was rendered unconscious and died two hours later. His CO commented on how John was one of those men who could always be relied upon, and cool in a tight place, ‘and we have been in some of them together’, he wrote. “I believe that Lieut. Newington wrote and told you the terrible news about your son John – but his letter would probably only be an official message, whereas I write to you as one who has lost his greatest friend – I can hardly yet realise that he has gone. John and I were very, very close friends, and had gone through everything together, starting the first night in the same advanced trench at Messines, and from that time we shared everything, beds, smokes, leaves, etc., and any jobs that were going. When they made me an officer just lately I lost sight of him a bit, but we always used to chat when we met, and he often came round to my billet with other friends, and we would have a smoke and chat together. I went down to the trenches in the evening to help bring his body back, and we took him down to the dressing station, and it was an honour to me to help carry the stretcher. I arranged for the burial in a little soldiers’ cemetery, which one of the regiments out here has bought, and where all the soldiers who have fallen in the fighting round here are buried, – it is beautifully kept, and each grave has a cross and a little name plate. I have ordered a little brass one for John, with the details on it, and have arranged to have the grave photographed and the cemetery as well. The Chaplains read the service, and Sergeant Piper Gray, the Doctor, and myself, Sergeant Cundell, and Lance-Corporal Green, of his Company attended as mourners. The whole regiment would have liked to come (but we were in the trenches) as everyone was very proud of him. He was a boy absolutely devoid of fear, always cheerful, and his example was a great help to everyone around him. I can speak very feelingly about this, as I have never known him depressed under any circumstances. All his papers and effects were given to me and I have them now. “I have also got his bonnet which he was wearing when shot, and the bullet holes are in it. Would you care for me to send it to you? Or if you think it is too ghastly, I would send his cap and badge alone. I cut off 6 buttons from his tunic and his Corporal’s stripes from his jacket, and will send these home to you, or his sisters, if you would like them. He had also bought a little silver brooch, London Scottish Crest, for his sister Dora [Dorothy]. This I will also forward to you. “Please write and ask me any more questions you like, or his sisters would like to know, and I will try and answer them. It will not be troubling me as he was my great friend, and it was a friendship cemented by conditions and hardships of the firing line. “With all my sympathy to you in the loss of a noble son, and to his sisters in the loss of such a brother. 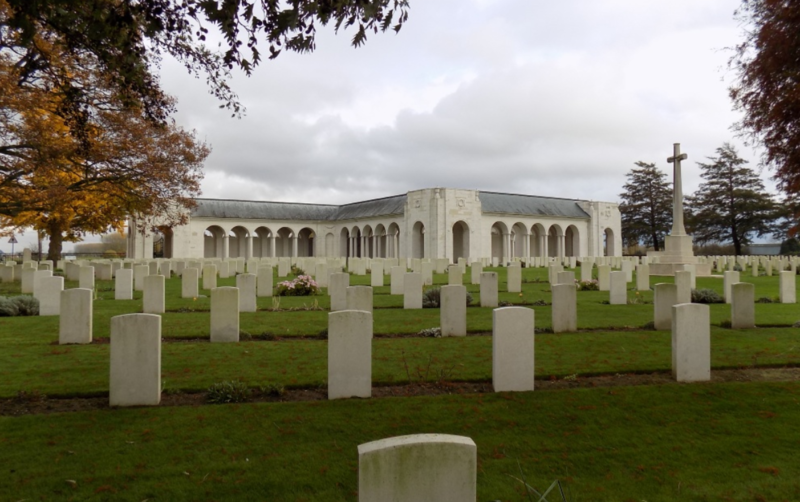 John is remembered at Le Touret Military Cemetery, Richebourg-L’Avoue, Pas de Calais, France, in section II, row G, grave 3. (Full details are on the Commonwealth War Graves Commission website.) His headstone reads: He was a fearless and a gallant lad and died on the field of honour. John was awarded the British and Victory Medals and 1914 Star.